Hello wine lovers and happy wine Wednesday! I hope you haven’t been put off by the not so stellar tour posts I have written about. It is my hope that I can turn some people on to a few new champagne houses and at least suggest they avoid others. That being said I am thrilled to say that the best and most incredible tour I had while in Reims was at Lanson Champagne. 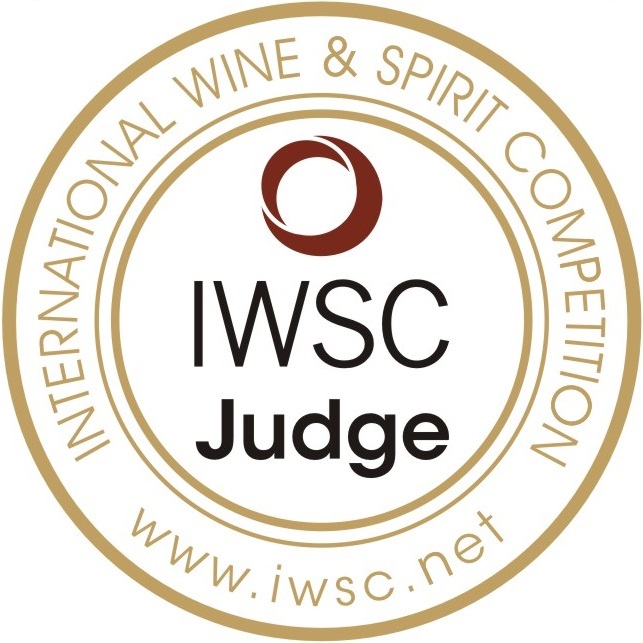 Happily, I was introduced to Lanson Champagne in January of this year when I went to their vertical tasting seminar at the Vancouver International Wine Festival. Lanson’s presentation was nothing short of the perfect blend of refinement paired with a relaxed and elegant approach. I fell – hook, line and sinker – for this champagne house and it was here that I reserved my first tour. I arrived a bit early for my tour, introduced myself and said that I had been to a fantastic vertical tasting by Lanson at the VIWF in January. Lyne, the hostess who led me through the tour, asked me to join a private tour with two other people and that the tour was complimentary. Thank you! So, I followed Lyne into another room where two truly lovely Brits were waiting…Zoe and Sam. The House was elegant but not stuffy and the people waiting for their tours all looked keen and energized. Yay! Lanson has about 34,000 hectares of vineyards and we headed outside for a look at one hectare of Cuvée Clos Lanson grapes that will be on the market for the first time this year – I will be getting a bottle of that! Lanson has five press houses located throughout the Champagne regions for immediate, gentle pressing of the grapes and the production house is located in Reims. 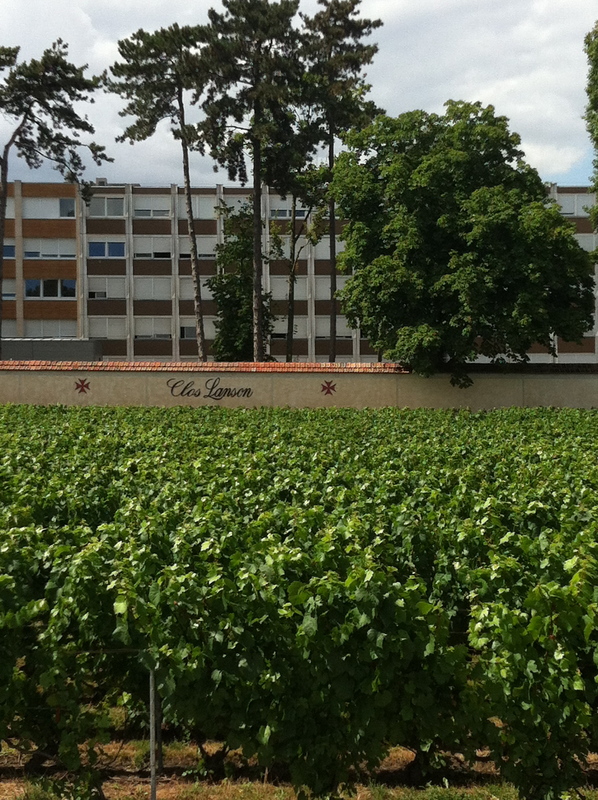 Lanson is the fourth oldest Champagne house in France and was founded in 1760. Back inside, I realized we were actually in the production centre! OMG – this is what it is all about! 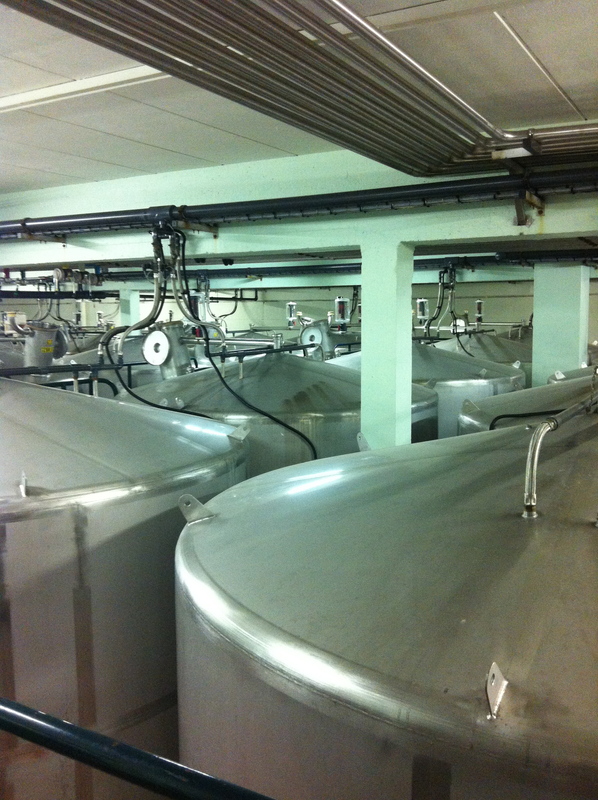 Lyne showed us the stainless steel vats that they use for 2 – 3 weeks for primary fermentation and I learned that 100 vats produce a total of 100,000 hectolitres of wine which equals 13 million bottles of Champagne…I was clearly in heaven! They do their blending in February and bottle from March to July. 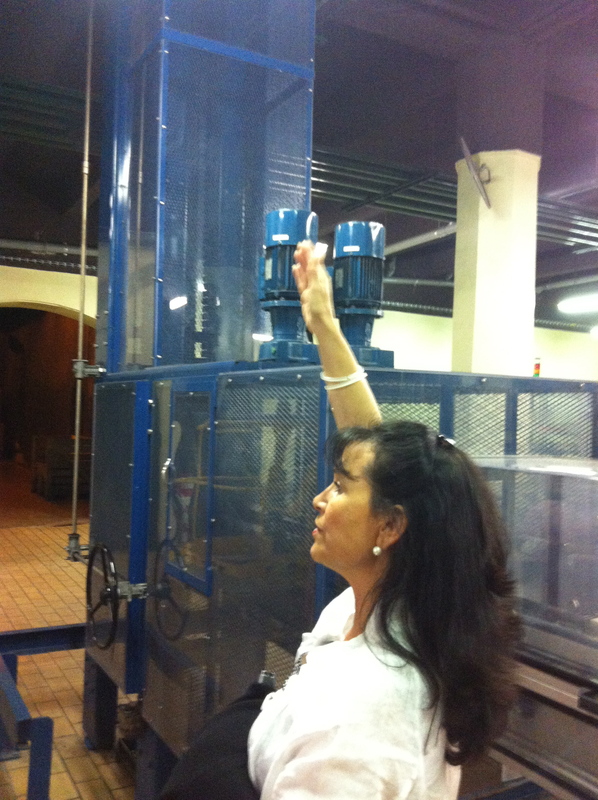 Lanson has 7 KM of caves underground and 20 million bottles in the cellars…!!! Lanson Champagne is a unique champagne in todays’ market as they do not put their champagne through malolactic fermentation (MLF). Malolactic fermentation, simply put, converts malic acid into lactic acid and produces a less fruit forward style of champagne. By not using MLF, Lanson’s style focuses on fresh, clean fruit flavours that are aged a minimum of three years to balance acidity. Lanson Champagne can age for a very long time because the MLF process is not used and hasn’t sped up the aging process. This is the original way champagne was made and Lanson seems to be the only house that chooses to stay true to tradition. 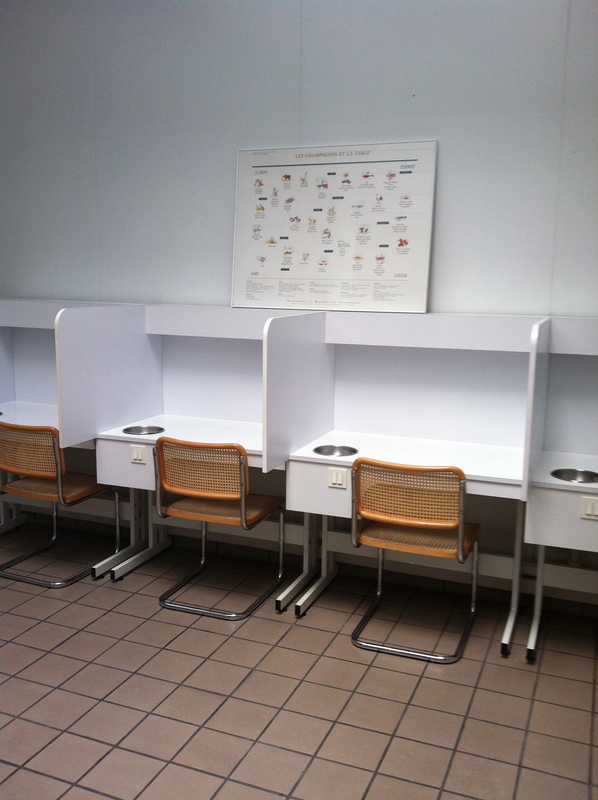 Tasting room – everything needs to be white. Lyne was, hands down, the perfect hostess for the Lanson Champagne house. Her knowledge and information was addictive and I wanted to know everything she knew about champagne. She led us back to where we started our tour, about one and a half hours later, and brought out glasses for our private tasting. We tried the White Label Champagne Brut that was crisp, light, refreshing with a hint of sweetness – perfect to have with a slice of fruit in it. It had aromas of orchard fruit, namely pear and some floral notes. Yum. Then, Lyne poured us a glass of their best-selling non-vintage Black Label Champagne Brut. Made from 50% Pinot Noir, 35% Chardonnay and 15% Pinot Meunier, this is a fantastic anytime champagne that we have access to in the Vancouver market for $64.99. It is structurally quite beautiful with a load of bubbles and flavours of toast and red fruit…sublime. 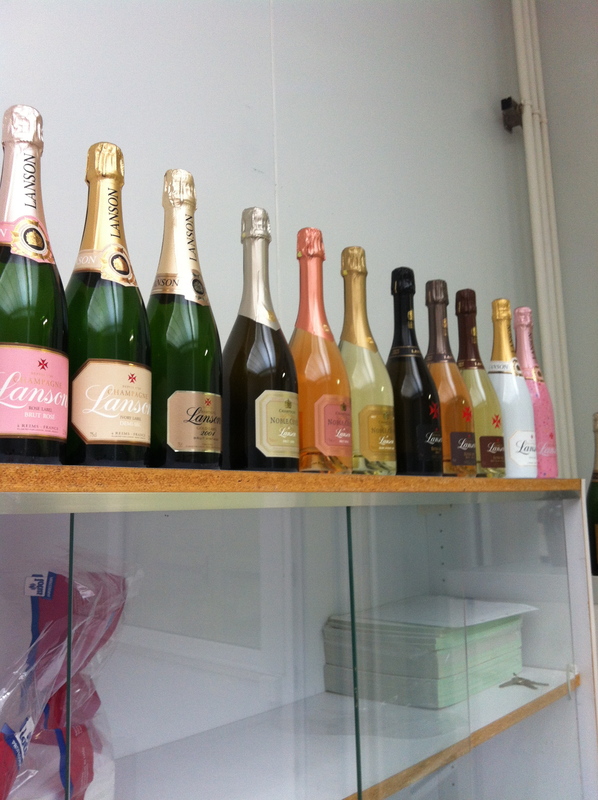 A small selection of Lanson Champagne! When it was time to leave, I felt like if I were to live in France and specifically in Reims, it would be here, at Lanson, where i would hope to work and inspire people to learn more about champagne and its different methods. The House was lovely, the tour was so insightful and informative, and there was a gracefulness about the environment that I want to visit again. Ultimately, Lanson has stayed true to tradition and the original methods of champagne production and their champagne is divine. Thank you for being the highlight of my time in Reims. A perfect “Hell Yes” in my GGG grading scale, please make time to visit Lanson if/when you visit Reims…you will not be disappointed. I was glad to read that you found a “hit” of a Champagne tour.